24 Healthy Lunch Recipes for Picky Kids That Will Keep Them Energized , dinner, and snack recipes too. 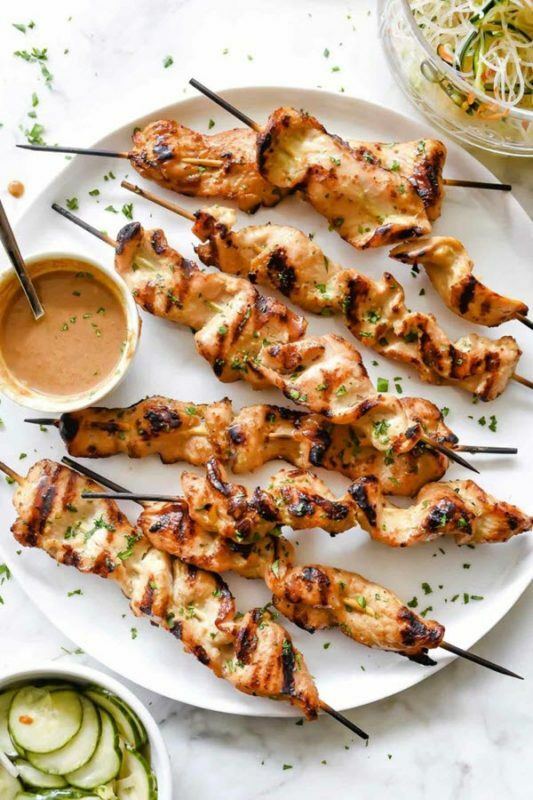 Chicken tends to be a sure-fire winner among kids and this chicken satay recipe from foodiecrush.com makes for a simple and healthy lunch. The recipe involves marinating the chicken and slicing it thinly, so you can be certain that you end up with delicious and flavorful meat. The combination of flavors is also a very good choice for kids. You have the peanut taste from the satay, along with the almond butter dipping sauce and a smoky undercurrent. This combination is also unusual enough to ensure that adults enjoy the lunch just as much as their kids. 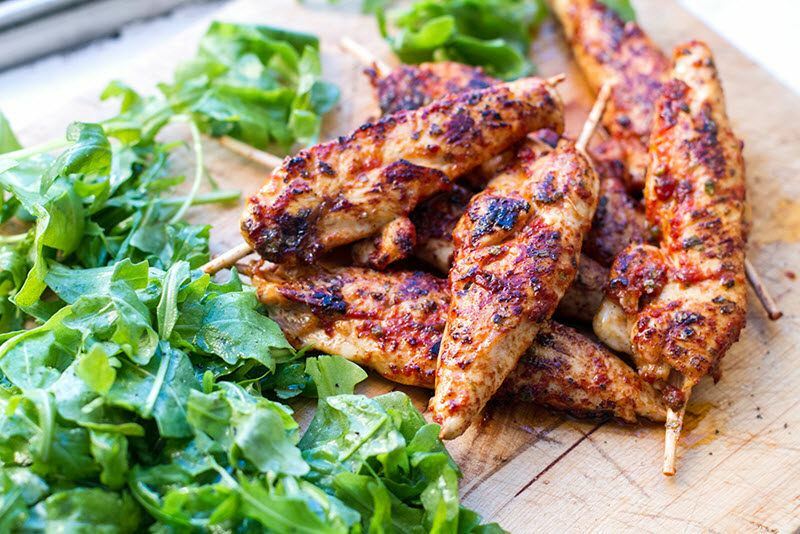 This recipe from eatdrinkpaleo.com.au showcases another type of chicken skewer that you can try. The first big difference is the flavor combination. This relies on marjoram and tomato to provide the bulk of the taste. The tomato alone strongly stands out. It’s also a flavor that’s already popular with kids. There is a green leaf salad as part of the recipe too, which could be included or ignored, depending on your preferences. Chicken skewers like this are always good as a lunch item. They’re pretty simple to make and fast to cook. You can even piece the skewers together ahead of time, so they’re ready to be cooked on the day. Cold chicken skewers also make great additions to a lunch box. 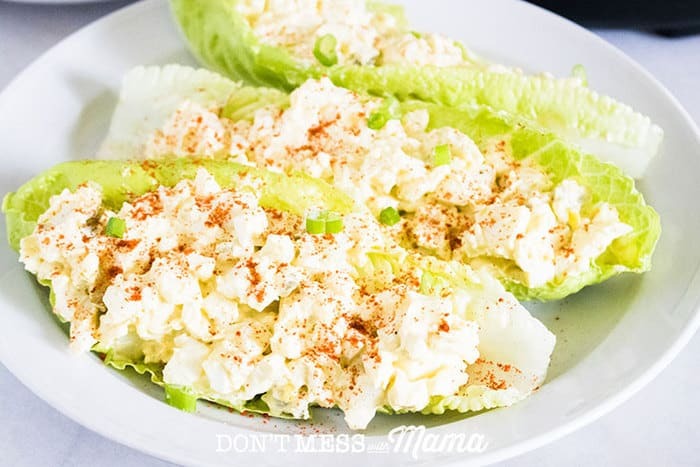 This recipe from dontmesswithmama.com has a focus on making egg salad even easier to prepare. As Tracey mentions, egg salad is always a great choice for lunch. The taste is already popular and the salad is more interesting than having meat sandwiches every day. The Instant Pot style allows you to quickly make the eggs – with the whole dish taking just 20 minutes from start-to-finish. Egg salad is also a flexible meal. The recipe provides a simple combination of ingredients that can get you started. There are plenty of other flavor profiles out there. Even just adding an extra spice can make the eggs taste different again. A recipe like this one is never going to be enough for a lunch on its own, but it isn’t designed to be either. 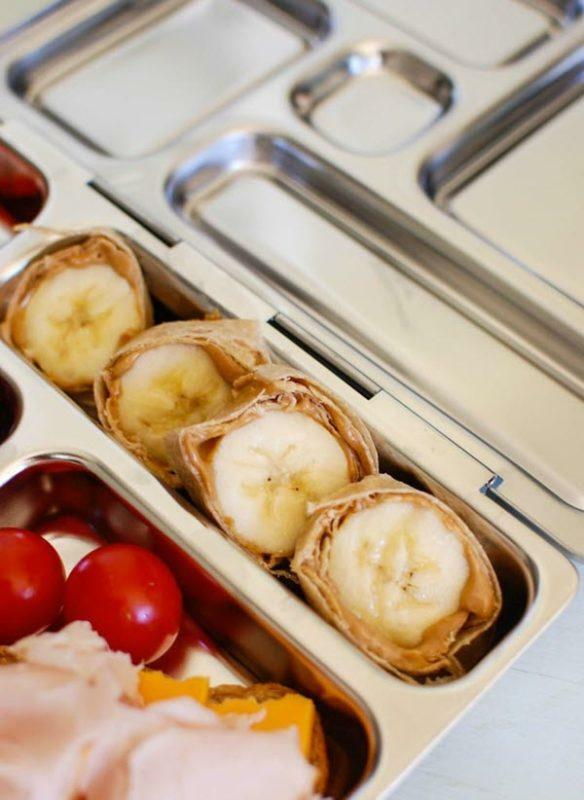 As Julia from acedarspoon.com showcases, the roll ups work best as an inclusion in a healthy lunchbox. The recipe is easy to prepare. This gives you the ability to make the roll ups as snacks instead. The combination of ingredients is a natural fit for kids. You’re also relying on flavors that they will already love. It’s easy to see how the meal would be popular, even among the pickiest of eaters. Lunch recipes like this are ideal for days when you have kids at home with you. The recipe itself comes from everylastbite.com and includes a strong reliance on Mexican flavors. One of the best aspects is the chicken patties. These are created from natural ingredients, including chicken breasts and various spices. The style creates burger patties that are easy to eat and are much healthier than processed versions from fast food stores. 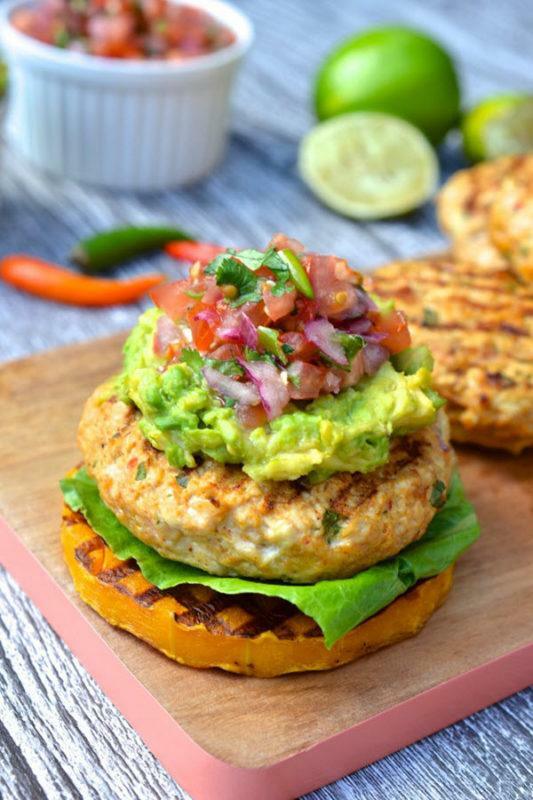 The burger is a bun-less one, relying on a slice of sweet potato or butternut squash to give it a solid base. You don’t need to do this if you have picky kids. You could simply serve the burger on a hamburger bun instead. 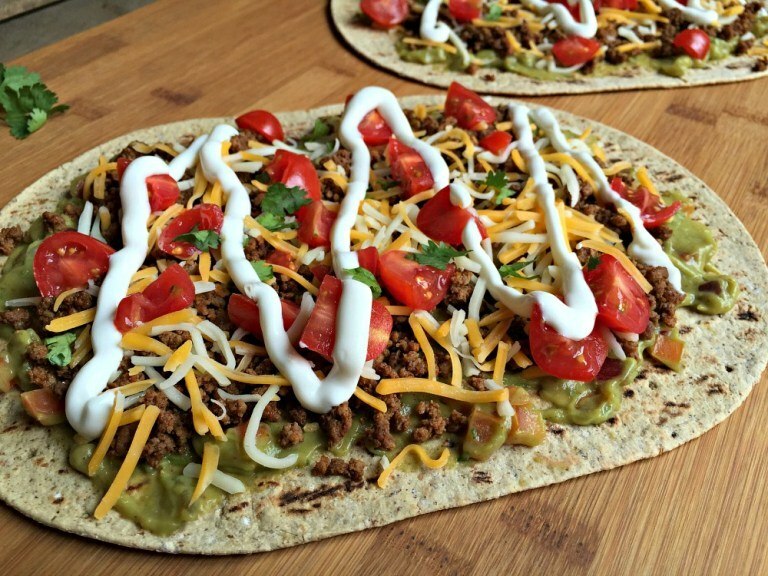 Burrito flavors are always fun, but you don’t need to make the meal in a traditional manner. Marjorie from apinchofhealthy.com offers an alternative approach that works well. The recipe is much more than just a different way to serve burritos. 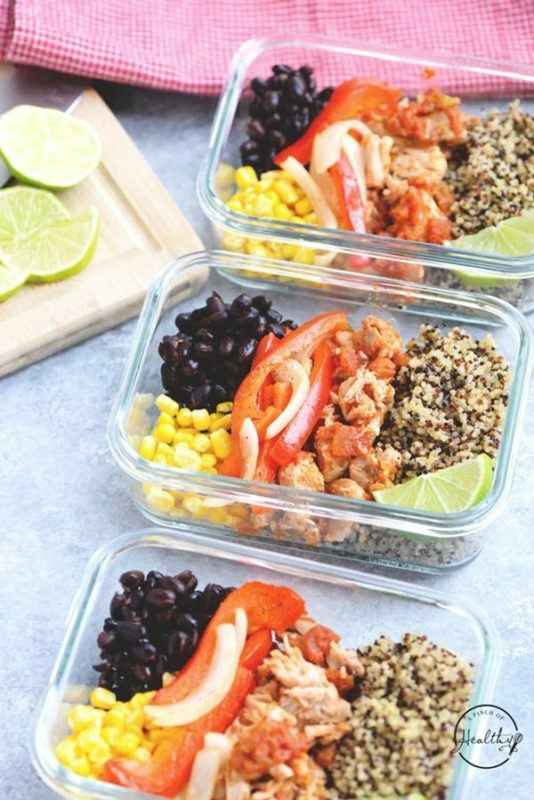 By using quinoa, Marjorie creates a meal that is satisfying in its own right, without the need to worry about a wrap. The bowls also make for a fast and easy lunch. They can simply be reheated when the time is right – no mess, no fuss. The bowl style also makes it easy to switch in and out ingredients. This allows you to tailor the meal for the kid who will be eating it. Pizza is always a popular meal choice for kids, but it often isn’t a healthy one. Store-bought pizzas tend to be packed with artificial ingredients, while also being loaded with cheese and grease. This recipe from garnishwithlemon.com is a great alternative. It’s not just any pizza either. The combination of BBQ and chicken means that the dish packs a flavor punch. This is also a flavor combination that most kids will love. There are even some veggies included in the form of onions and cilantro. Of course, you could skip both of those ingredients for kids that are extremely selective about their food. 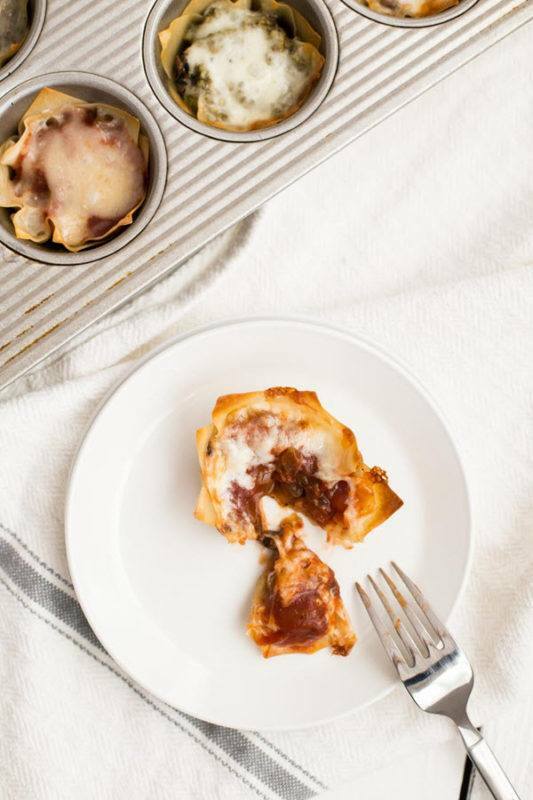 Milisa from missinthekitchen.com offers this great recipe for you and your family. The fact that the hoagies are slightly messy to eat is an advantage when it comes to serving kids. This should help to make them passionate about the meal. There is also coleslaw included – helping to make this an especially healthy lunch. Of course, the main feature here is the meatballs. 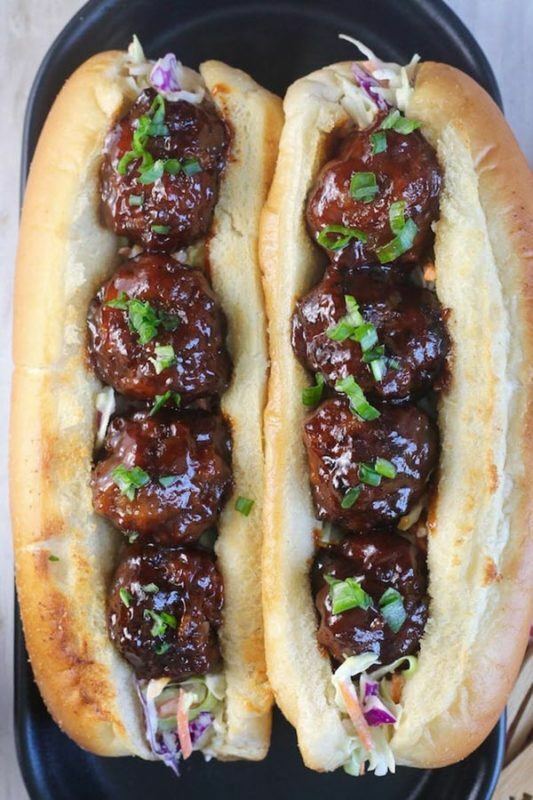 Milisa has some interesting techniques that make these so much better than any other meatballs that you have tried in the past. Trust me, the recipe truly is worth the effort. Here’s another choice for any pizza lover. This time the recipe comes from chocolateslopes.com (which is an awesome name for a food site!). As the name suggests, the pizza takes advantage of Mexican flavors. This includes beef with taco seasoning and guacamole. The style has plenty of health advantages, especially as the flatbread uses contains fewer calories than most pizza bases. The pizza is also fast to prepare and can be fun to eat. Kirsty mentions that her kids end up picking out some ingredients, rolling up the rest and then eating it. The simplicity even means that kids could put their own pizza together. 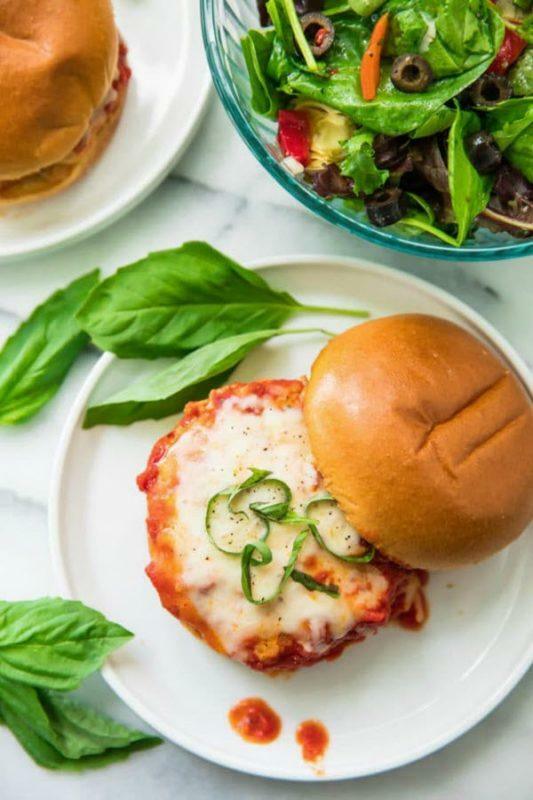 This homemade chicken sandwich recipe from flavorthemoments.com is another case where you are creating a healthier homemade version of a dish that you might normally buy. I love how this isn’t just your typical chicken burger either. 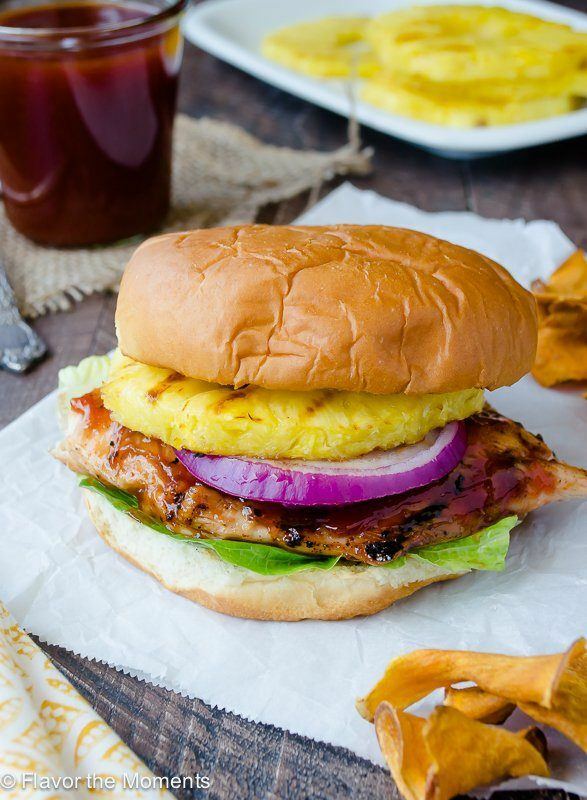 The honey pineapple barbecue style creates an unusual flavor combination that is bound to be popular. Besides, burgers always make great lunches, as they are so easy to customize. Individual family members can make their own choices about the ingredients that they include. For example, many kids might leave out the red onion but eat all of the rest. Mediterranean flavors tend to be popular among kids and adults, making them a great choice for healthy lunches. There is something fantastic about the freshness of the flavors. The meals also act as a way to get even the pickiest kids eating vegetables. 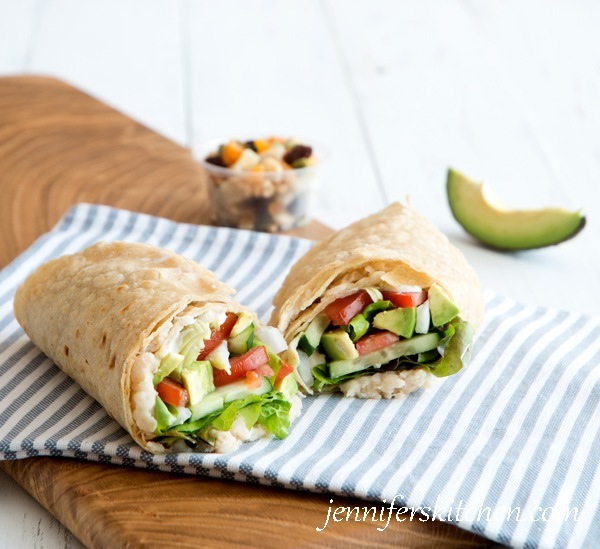 These wraps from jenniferskitchen.com are one fun Mediterranean recipe that you can try out. The great thing is that wraps are entirely customizable. You can easily add and remove ingredients to customize these to whoever is going to be eating them. Even if you need to take half of the ingredients out for some kids – the wraps remain a refreshing and flavor-packed lunch. 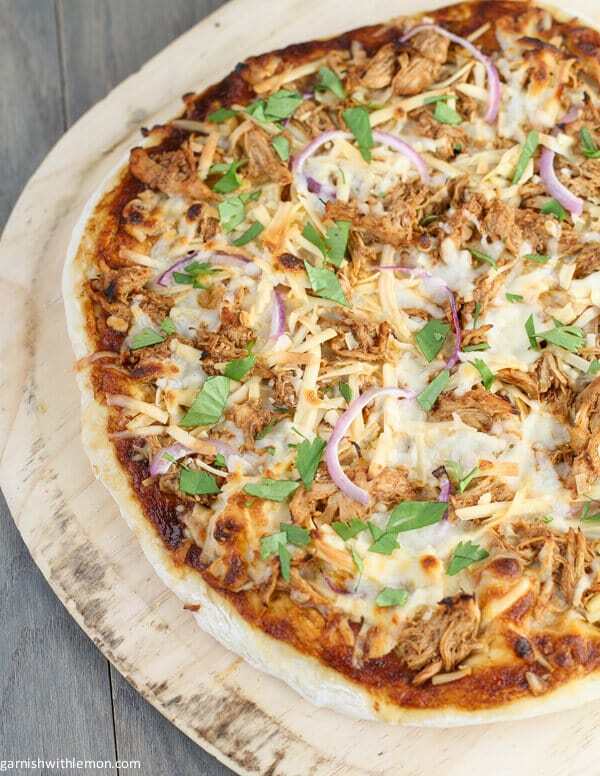 One standout feature of this pizza from boysahoy.com is how easy it is to prepare. 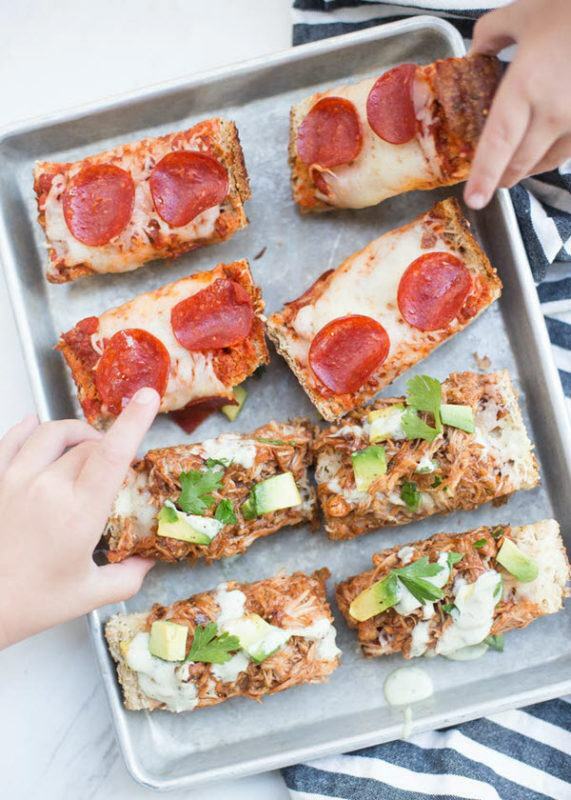 As the name suggests, you’re simply making pizza on top of French bread. The style also allows you to make whatever changes you want to – tailoring the recipe to the people who are going to eat it. In fact, the image even highlights the BBQ chicken version of the pizza, along with a more conventional pepperoni and cheese option. 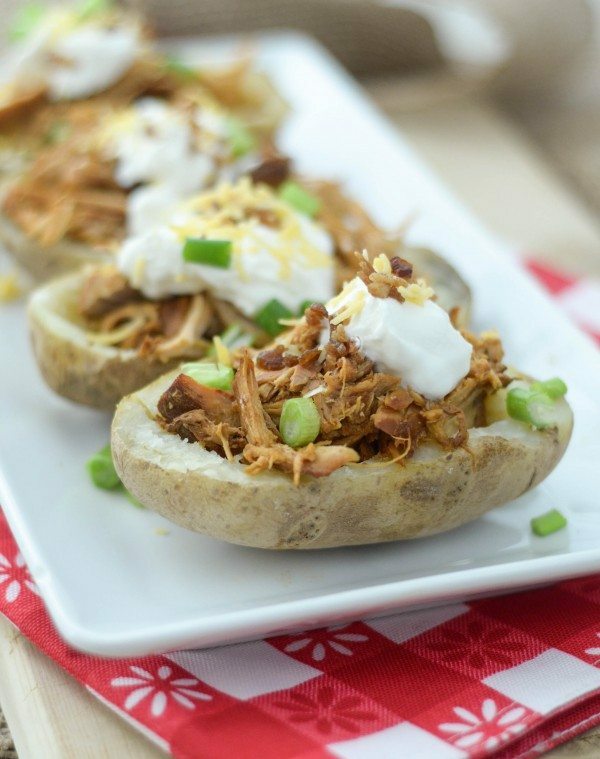 Shredded BBQ chicken is also a good option for health. It tends to be lower in fat than many other potential pizza toppings. The chicken is also naturally moist. This means that you can use less cheese (or even none at all). The visual presentation is one of the coolest things about this recipe from fivehearthome.com. The servings look like a cross between a sandwich and a burger. They’re also messy enough that most kids would love them. 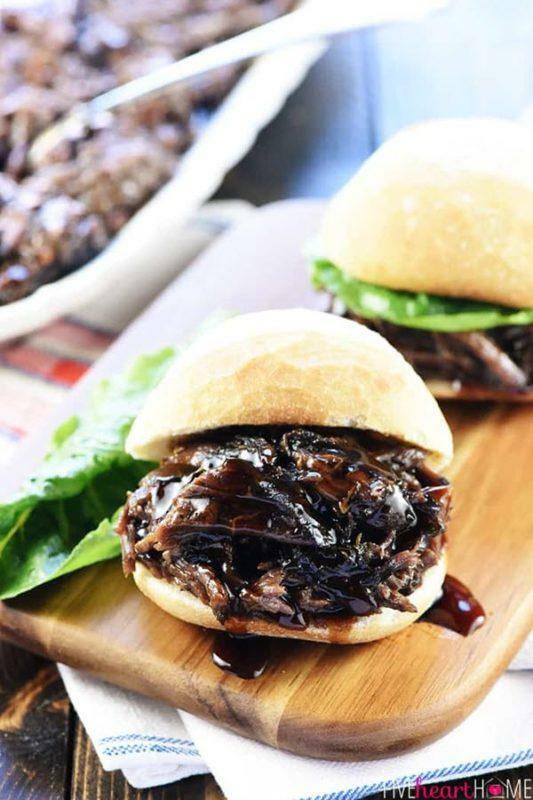 If that wasn’t enough, honey balsamic is a pretty safe flavor for shredded beef, so it should be easy enough to get your kids to try the recipe. Another good feature is how easy these are to prepare. The shredded beef is simply made in the slow cooker. This allows you to cook a large amount of meat at once – ideal for feeding guests or for making plenty of leftovers. This recipe from kimscravings.com is a fun alternative to conventional burgers. As the name suggests, the recipe is a combination of two different meals – chicken burgers and chicken parmesan. The idea works well, creating a meal that is rich in flavor and looks amazing on the plate. As Kim mentions, you don’t need to worry about the chicken drying out either. This would normally be a concern, but the ingredients chosen help ensure that everything stays exactly how it should be. Mac and cheese is a classic comfort food, but it can get a little boring – particularly for adults. 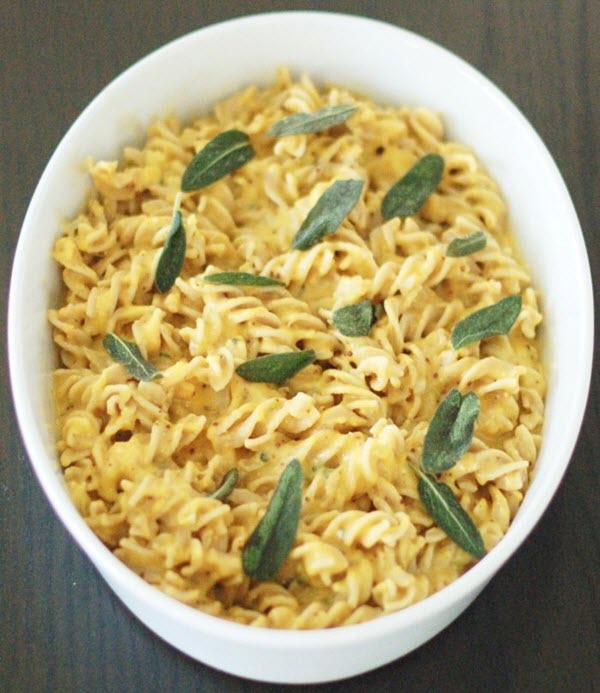 This mac and cheese version comes from eatgood4life.com. It is a simple variation that makes the dish healthier and much more interesting too. As the image shows, the main difference is the use of various colored peppers. These end up being a perfect contrast and are enjoyable, even when kids are very picky. You also have plenty of chances to customize, such as changing the cheese and/or the seasonings that you include. You might even experiment with other additions, like tomatoes, to make the lunch more interesting still. There are so many reasons why this recipe from iowagirleats.com is such a good choice for kids. For one thing, it’s cheeseburger flavored! That aspect alone should get kids flocking to the table. This is also a hidden vegetables recipe. It’s a great way to get healthy nutrients into your kids, without them even realizing. 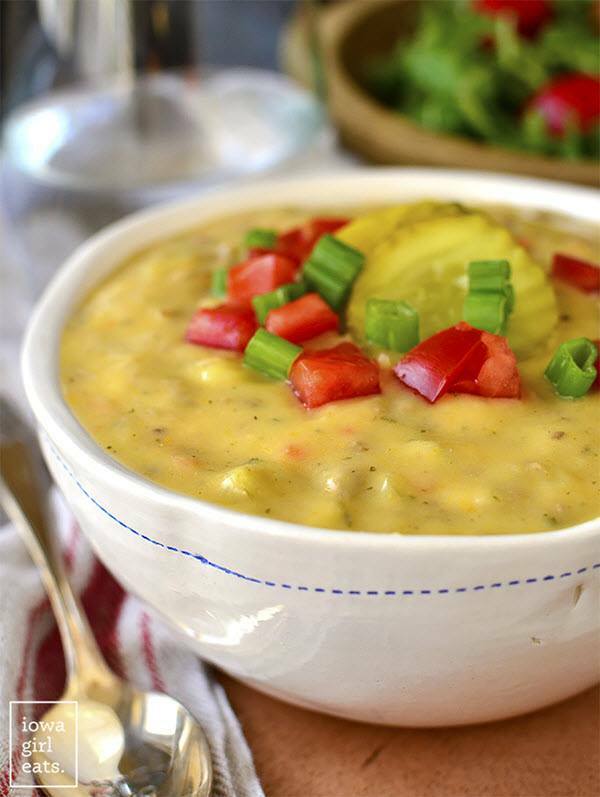 The recipe is dairy free and relies on vegan cheese, but you don’t have to make it that way. As Kristen mentions, you can easily add in regular cheese instead. 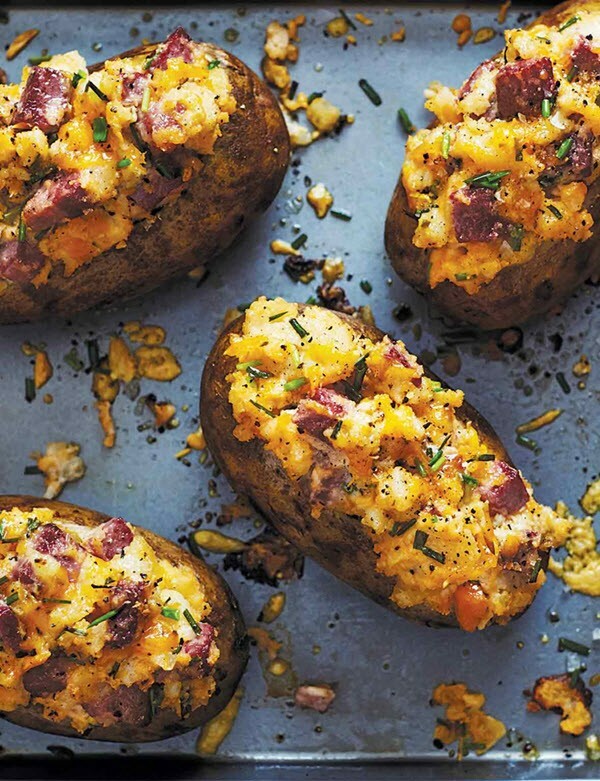 It’s easy to see how these twice-baked potatoes would be popular. The recipe is one of many featured at leitesculinaria.com, which is reason enough to check it out. I’m not kidding. The site hosts a wide range of amazing recipes. These potatoes are just one example. As for the potatoes themselves, it’s easy to see why they would be popular among kids. They have all the flavors that children love and no ingredients that they’re likely to hate. Plus, you can easily make this type of lunch from leftovers, which is an added bonus. 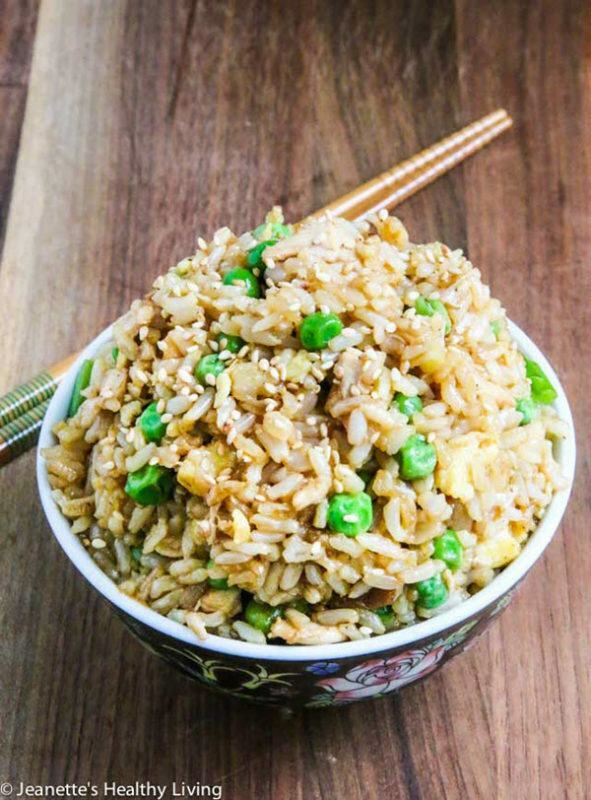 Fried rice always works well for lunch or dinner, partly because it’s such a simple dish. It also reheats well and makes a good addition in many lunch boxes. This particular version comes from jeanetteshealthyliving.com. It’s a great illustration that vegetarian recipes don’t need to be boring. One of the best things about the recipe isn’t obvious from the image. I’m talking about the stir-fry sauce that is used. Jeanette has developed a recipe for the sauce that is simply amazing, creating an aromatic dish. You could also add in other items, like meat, if you wanted to make the fried rice more complex. It would taste good either way. The site mommyhatescooking.com hosts this fantastic lunch recipe. The style is relatively simple, but that’s actually a good thing. It means that you could easily skip some ingredients (like the spring onions) or add in other ones that your family wants. Potatoes like these are also very popular among kids. You can let them build their own meals, giving them the chance to decide how much they want of each topping. Doing so is a great way to get kids involved in what they’re eating and passionate about their food. This recipe comes from mommypotamus.com. The skewers are called kid favorites and it is easy to see why. These skewers would be especially fun to eat. In fact, kids would often find them easier and more enjoyable than large chunks of steak. 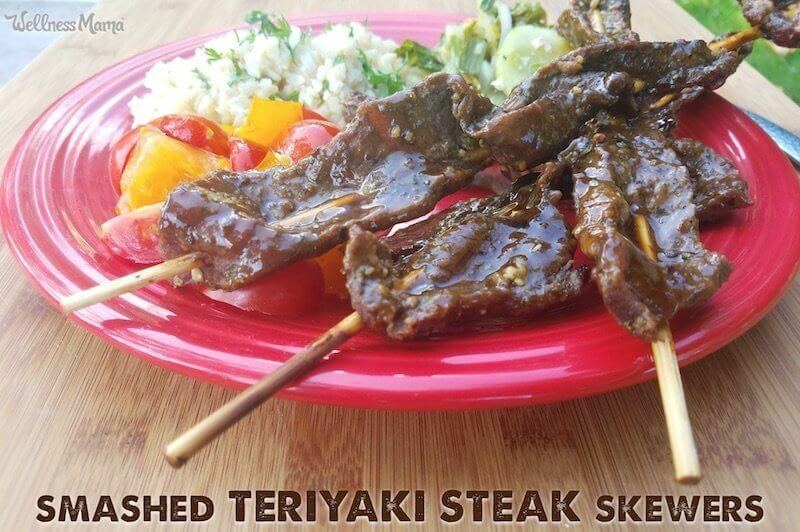 The skewers would be an easy addition to a barbecue. Cold ones could also be included in school lunchboxes. Here’s another interesting lunch idea to try out. It comes from mycaliforniaroots.com and is different to any other lasagna recipe that you’ll try. The style makes these cups perfect for lunch, especially if you’re feeding a group. An even better feature is that these are fast to make. They can be ready to go in 40 minutes or less. You couldn’t do that with a conventional lasagna recipe. It’s also easy to make the mini cups in different flavors. For example, Raquel suggests using marinara for one type and pesto for another. You can use your imagination to find other variations. 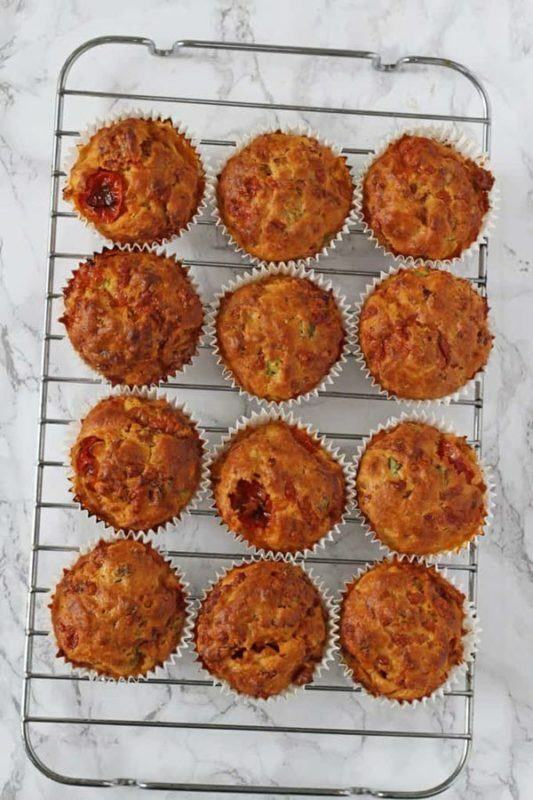 These savory muffins, from myfussyeater.com, are a great way to provide pizza flavors to kids who are taking lunch to school. You might even decide to have some of them for yourself. Muffins like this are also ideal because you’re making a large number at once, without much effort. In this case, you’re making 12 muffins at a time and only using a single bowl. 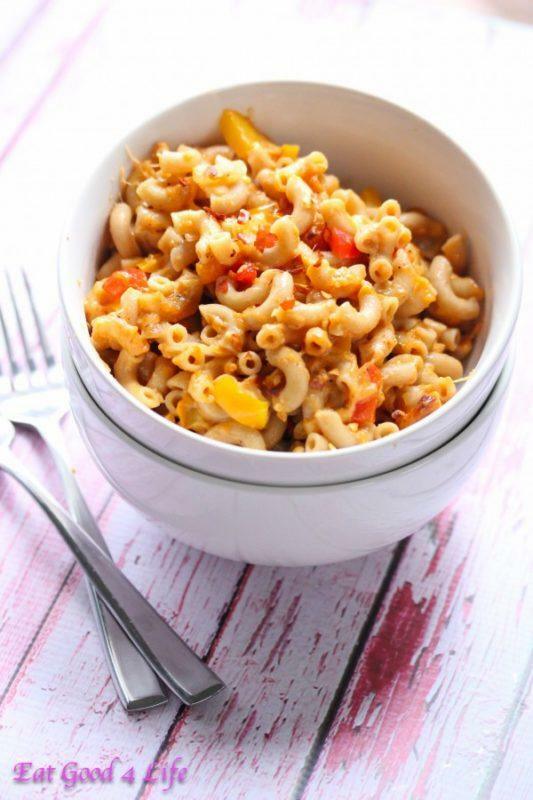 Here is another healthy recipe for macaroni and cheese. This time the dish comes from the site jessicalevinson.com. The cooking process is relatively detailed for this type of meal, requiring roughly an hour from start to finish. Trust me though. The meal is worth the wait. You could easily have this macaroni and cheese as part of a dinner or even a snack, but it really is best suited for lunch. It is hearty enough to keep everyone satisfied, but light enough that kids can play again soon after lunch. Pasta is always a fantastic lunch choice, especially when the recipe isn’t too heavy. 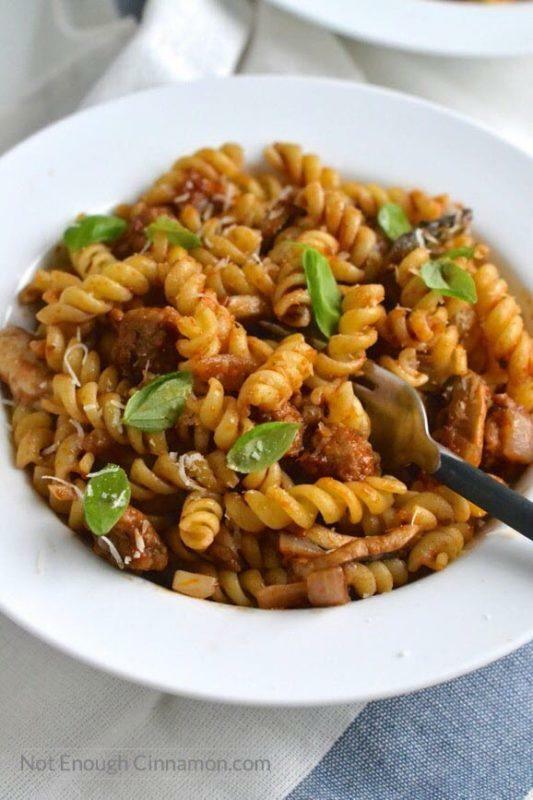 This Italian Sausage Pasta from notenoughcinnamon.com is a perfect example to try with your family. As with many recipes, the biggest benefit is that you’re using healthy and wholesome ingredients. You can also choose which type of pasta you rely on. Marie recommends fusilli pasta or zucchini noodles (zoodles). Some other pasta types may work well too.